Confused About Diet? Amy's Here to Help! What's the optimal macronutrient ratio? Are dietary fats healthy or harmful? If we don't eat dairy, how do we get enough calcium? How do we keep our blood sugar balanced? If we're having trouble reaching a healthy weight, what can we do? How can we troubleshoot digestive issues? Amy Kubal is a Registered and Licensed Dietitian with both Bachelors and Masters Degrees in Human Nutrition and Dietetics. She is one of the rare RD’s in our country who understands and advocates the paleo diet and lifestyle. She's sharing her expertise in this episode. The Meal Plan Challengemakes getting started on the AIP easy. Amy Kubal s a Registered and Licensed Dietitian with both Bachelors and Masters Degrees in Human Nutrition and Dietetics. She is also the voice behind the Ask the RD Column in Paleo Magazine. When she first learned of the paleo diet, she thought it was crazy and she contacted Robb Wolf to tell him he was being irresponsible. 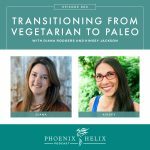 He challenged her to try the diet herself, and when it worked for her, she re-evaluated her beliefs and changed the way she counseled her clients about diet. She doesn't view paleo as a religion. She believes we each need to find the “shade” that works for us. She wrote a great (and very funny) article about this called Seven Shades of Paleo. Depending on tolerance, some of her clients do well reintroducing non-gluten grains such as white rice, gluten-free oatmeal and quinoa. Some do well on dairy. Some do fine with corn. Others do fine with legumes. If you're having trouble doing strict paleo or the AIP and keep “falling off the wagon” you might try paleo + these foods and see if that works for you. She would rather people expand their diet with some of the above foods than binge on paleo desserts. Resource: Where Natural Sugars Fit on a Healing Diet. Note: if you're doing the elimination phase of the paleo autoimmune protocol (AIP) these foods are avoided. 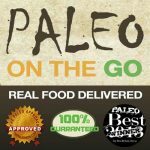 But once you have gone through the reintroduction process for paleo foods, you can also try some of these to see how they work for you. It's all individual. Resource: AIP Reintroduction Guide. Fats are essential to many body functions. They provide our moisture. They are part of every cell membrane. They are a great source of energy. 60% of our brain is fat. They are the building blocks of hormones and Vitamin D. Many nutrients are fat-soluble, meaning we can't absorb their nutrition without dietary fats. Fat is only harmful when combined with high amounts of processed carbohydrates. The type of fat matters, too. Hydrogenated and transfats aren't healthy, and the common vegetable oils consumed on the SAD diet are inflammatory oils. Amy's favorite fats are ones found naturally in foods such as olives, avocados, coconut and nuts/seeds if tolerated. She also likes olive oil. Animal fats like lard, tallow and duck fat are fine for most people, but there is a segment of the population who are sensitive to saturated fats. If you notice your blood lipids are too high, try reducing the saturated animal fat and replacing them with olive oil and avocado oil instead. Prioritize fats that are easier to digest, like avocados and olive oil. Be aware of the amount of fat you're eating. You want some at each meal, but not too much at once. You can also take digestive enzymes that help digest fats. Avoid raw vegetables. Well cooked veggies are easier to digest. If you're in the middle of a flare, blend your vegetables into a drink and have that alongside your meal. Eat smaller amounts spread throughout the day – whatever you can tolerate. Try eliminating some of the high-FODMAP vegetables. In time, as the gut heals, people are often able to eat greater quantities and a wider variety of vegetables. Also, reintroducing white rice sometimes helps control the diarrhea symptoms in people with IBD, as well as helping with weight gain in people who are underweight. It's different for everyone, and needs to be based on your health and your goals, and it takes some experimentation to find what works best for you. 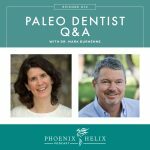 For people with autoimmune disease just starting their paleo journey, she removes a lot of the starch and sugars from the diet, because she finds that they can be inflammatory for a lot of people. She recommends people start with just 1/2-1 cup of starch daily and 1-2 pieces of fruit daily. For protein, she recommends a palm-sized serving at each of your 3 meals. Eat lots of non-starchy vegetables (2-3 cups per meal). She likes Terry Wahls' recommendations. Check out the A-Z Vegetable Recipe Roundup to help you find new vegetables to try, and tasty ways to prepare them. Also be sure to include 1-2 fats at each meal, either naturally part of the food itself (like avocado, olives or a fatty piece of meat), or an added healthy fat like olive oil. Start with easier to digest proteins: seafood, eggs if tolerated, chicken, lean meats and ground meats. Start with smaller amounts. Over time as your gut heals, you'll be able to increase your quantity to a palm-sized serving. Be sure to eat plenty of vegetables alongside your meat. The fiber from the vegetables is necessary to gut health. Digestive enzymes can also help. When our blood sugar is out of balance, it can cause autoimmune flares. People with adrenal fatigue are especially vulnerable to blood sugar imbalance. Steps to balancing blood sugar: (1) Avoid anything sweet at breakfast – no starch, fruit or other sugars. (2) Limit yourself to 1-2 servings of fruit daily and 1 serving starch daily, and eat them in the afternoon or evening alongside some protein and fat. (3) Three meals daily is ideal for digestion, but if your blood sugar is out of balance, you might need in-between meal snacks. Only eat them if you're hungry, and be sure they are balanced. Don't choose fruit by itself for a snack. Some snack ideas are: 2 hardboiled eggs (if tolerated) alongside some raw veggies, liver pate on apple or cucumber slices, or some pouched tuna and avocado with veggies on the side. You can also track your blood sugar with a glucose monitor. Listen to Podcast Episode 68 for details. Canned fish is high in calcium, especially if the bones are included like sardines and salmon. Leafy greens are good sources of calcium: spinach, kale, collards, etc. Nuts are a good source also (if tolerated). If you're on a healing diet, you are optimizing your digestion and therefore your ability to absorb nutrients. This is often more important than counting milligrams. Getting calcium from food over supplements gives you all of the synergist nutrients in the foods that your body also needs. Amy believes in nutrition through food over supplements. There are only a few supplements she recommends as temporary help, under special circumstances: (1) Digestive enzymes if someone is having digestive difficulties. (2) Omega 3 fish oil if someone isn't eating enough fatty fish. (3) Vitamin D3 if someone isn't getting enough sun. (4) Magnesium before bed if someone is having difficulty sleeping. They sabotage blood sugar balance. Liquid nutrition absorbs quickly, and your blood sugar goes up and then crashes. This is very bad for autoimmune health. Most people put fruit or juice in a smoothie to make it taste good, upping the sugar load. Even blending vegetables concentrates their sugar. Blenders also destroy the fiber along with some of the nutrition. Could you sit down and eat everything that's going into that blender or juicer? If not, you shouldn't be forcing that much into your body in liquid form. This is how people can get too many oxalates or goitrogens in their diet. Most people wouldn't eat enough to be harmful but it's easy to juice enough to be harmful. When you first start a healing diet, focus on your autoimmune health rather than your weight. Often, when your autoimmune symptoms improve, your weight will self-correct. Always prioritize health first. That said, after you've been paleo for a while and are feeling better, if you're still having weight struggles, Amy has some advice. If you're having trouble losing weight, limiting the fruit and starch to 1-2 servings of each daily. This will also reset your hunger signals to be more accurate. Also look at how many fats you have at each meal. 1-2 is plenty, and people easily overdo in this area. Then, eat mindfully – don't do other things while you're eating. Really be present and pay attention to the whole experience. If you're having trouble gaining weight, pull back the non-starchy vegetables a little bit and add more starchy vegetables in their place. Also increase the fat considerably. Lastly, reintroducing white rice and/or gluten-free oats can help too, if tolerated. Amy doesn't believe in calorie counting, because every person absorbs calories differently. A calculator can't compute what's going on in your body. Sometimes when people are trying to heal and they discover they have multiple issues, they try to address them all at once. The problem with combining elimination diets is that our bodies need deep nutrition to heal, and you cannot get enough when your diet becomes too restricted. Working with a practitioner can help you prioritize. There are also many factors to address outside of diet that impact autoimmune health as well, such as stress, sleep, and the mind-body connection. We need to expand our view beyond just the food. They're not 100% accurate. 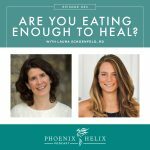 Amy has seen many clients avoid foods unnecessarily based on test results, as well as continue to eat foods that were a problem, because they believed a test over their body's reaction. Check out this article: Why Food Intolerance Tests Don't Work. Amy herself has a history of anorexia, so she understands this topic very well. Red flags: (1) You've been on the AIP a long time and are refusing to try reintroductions. (2) You're using the AIP as a weight control measure. (3) You have strict rituals around food in terms of times you eat and the order you eat your food. (4) Your health isn't improving on the AIP; in fact, it's getting worse yet you are continuing strict adherence to the protocol. (5) You're using food as a means to feel in control of your life. (6) Most people with an eating disorder know it on some level. If you have a history of eating disorders, an elimination diet like the AIP isn't recommended without the support of a psychologist who specializes in eating disorders and the knowledge of your physican. Restrictive diets can trigger old patterns very easily. 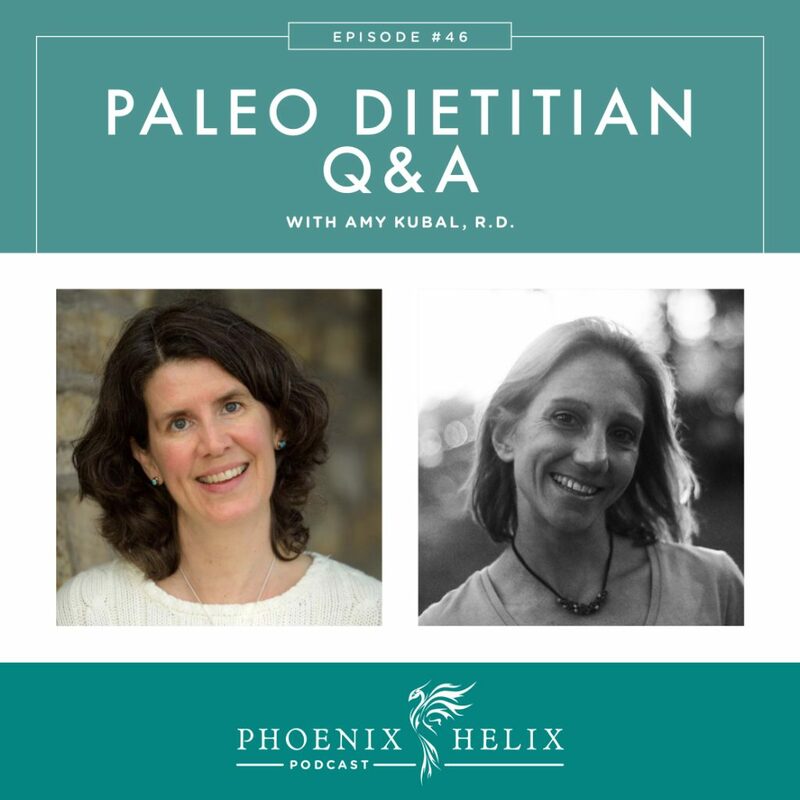 Resources: Amy's podcast interview with Robb Wolf about her eating disorder (2) Phoenix Helix blog post: Eating Disorders and the AIP. Bloating: Try a low-FODMAP diet. Constipation: Are you eating enough vegetables? Is it a combination of cooked and raw? Are you getting a wide variety? All vegetables contain fiber which helps constipation. Sometimes increasing starchy vegetables or resistant starch (like green plantains) can help. Lastly, a magnesium supplement can be helpful. Diarrhea: Lots of things can cause diarrhea. Try cutting back on coconut. Try reducing your dietary fats. Try decreasing the raw veggies. Try increasing your starch. And focus on easy to digest foods, like pureed soups and stews. If the troubleshooting steps above don't resolve your issue, try digestive enzymes. But try the troubleshooting steps first. Amy blogs and offers nutrition consulting through Robbwolf.com. You can also find her on Facebook and Twitter.